A fancy meal genuinely worth the time and effort. This really impressed my (admitably easily impressible) family. The pumpkin was a delicious change to the normal veg I use and using chili in my cooking almost never happens so this was a bit of an experiment. Luckily it paid off with delectable results! This is again stolen (and then adapted) from 'Easy Vegan' - only the second time I've used the book as I've found that almost all the recipes are too much hard work and require too many specialist ingredients for everyday so I'm just trying a few and I'll use these when I want to impress. Having said this, this tagliatelle dish didn't require anything out of the ordinary, except perhaps the pumpkin but luckily it's in season right now. New years (Septembers) resolution #1: eat more seasonal veg. Cooking time: Just over an hour with a couple of ten minute breaks whilst the oven’s on. n.b. The ingredients list also included the grated peel of a lemon but I was just too lazy to go to all that effort, maybe I’ll do it next time and then I can report on the difference it makes. 1. To begin with mix all the red pepper oil ingredients together in a roasting pan and put in the oven at 160­°C. Leave this for around 40 minutes, giving it a stir after every ten. 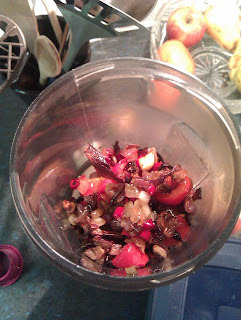 When it’s ready the edges of the pepper will just be starting to brown. During this time peel and de-seed the pumpkin and chop into bitesize pieces. Then give your leaves a wash and chop up the parsley. 2. While the mixture is still quite hot, blend in a food processor with 2 tablespoons of olive oil until you get a smooth paste, I had to be quite patient at this stage as I was using mums old blender which took its time! 3. 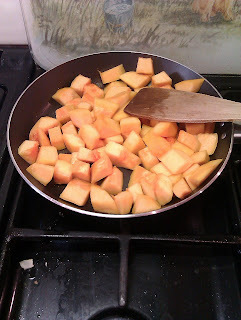 Heat a tablespoon of olive oil in a frying pan and fry the pumpkin for 10 mins turning occasionally to ensure it cooks evenly. 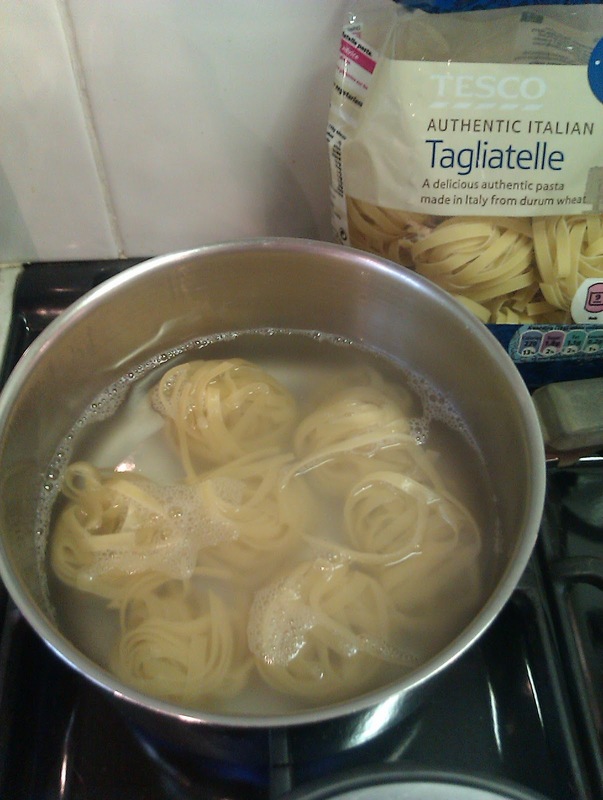 Whilst this is happening cook your pasta* to the recommendations given on its packaging. Mine took 9 minutes which was ideal. 4. 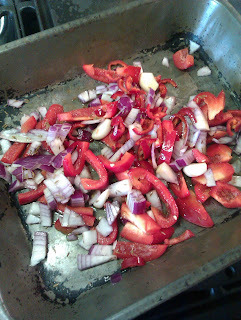 Drain the pasta and add 3-4 tablespoons of the red pepper oil. 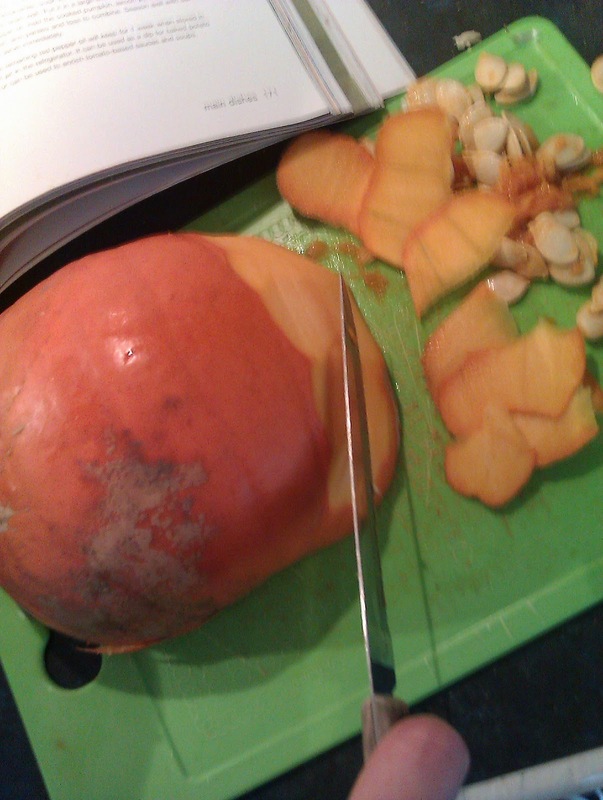 Now add the pumpkin, rocket, parsley and lemon juice and ‘toss’ the mixture. Add a little salt and pepper and you’re good to go! 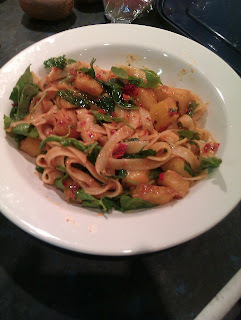 A fun dish which provides good practice at time management as well as a few other kitchen skills!